Find out more about the new Zidell development project, tomorrow night @ Umpqua Bank, 5:30pm. Recently, the Zidell family, owners of 33 acres in the South Waterfront, announced plans to develop a $20 million 118-unit apartment building in the South Waterfront. The building will cater to young professionals and employees/students working at OHSU. 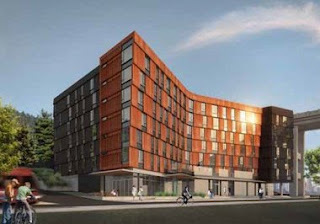 The seven-story building will be located at the corner of SW Moody and SW Grover (the small dead-end street just north of Gibbs – near the base of the Ross Island Bridge). The mixed-use development will also include retail and restaurant space. A unique and progressive feature of the development is the building's lack of residential parking; the building will instead feature bicycle parking and adjacent proximity to the Streetcar. Transportation options and transportation demand management will be key not only for this building, but for the district as a whole. To learn about this project, ask questions, or learn more about future Zidell projects, please attend Zidell’s Open house on Wednesday, May 30 at Umpqua Bank from 5:30 pm - 6:15 pm. Representatives from Zidell will be on hand to talk about the new building and answer questions. 3606 SW Bond Avenue, Portland, OR"